Concrete grinding is a perfect solution for the ongoing maintenance requirements of raised sidewalk trip hazards. Raised, uneven concrete doesn't look good. But more importantly, these surface irregularities pose serious tripping hazards. 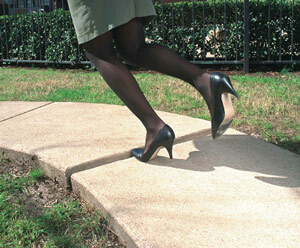 It's easy for any pedestrian to take a serious fall because of uneven concrete. If you have uneven concrete on your homeowner's association (HOA) property, apartment complex, or other commercial property, contact the concrete experts at Saber Foundation Repair. Our technicians have the tools, materials, and expertise to solve hazardous uneven concrete problems quickly and affordably. We use powerful, high-tech grinding equipment to take down protruding edges and smooth uneven concrete surfaces. Contact the restoration experts at Saber Foundation Repair today! We specialize in concrete solutions, such as concrete grinding and resurfacing and provide complete inspections and free estimates to Southern CA residents. We proudly service Los Angeles, Long Beach, San Diego and many areas throughout California. 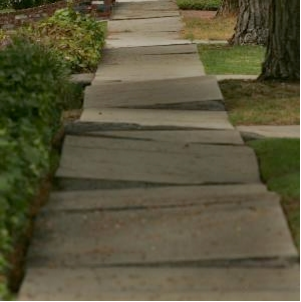 A misaligned joint is created when a sidewalk panel is pushed up from tree roots or because the panel settles due to poor subsurface soils. Saber Foundation Repair uses a walk-behind concrete scarifier to grind down the raised lip to an ADA-compliant slope. This reduces the chance of a trip and fall accident. We can also grind curb joints, humps in floors, and raised cracks. Most of our work is performed at apartment complexes and for homeowners associations. We also have large contracts with cities and school districts in the area. Prevent family or guests from falling on your property with concrete grinding. Trip hazard repair. Don't risk an injury on your apartment complex or HOA property because of uneven concrete. We can grind down protruding edges, raised cracks and other uneven concrete to restore safety. Leveling. Our machines are powerful but also precise, enabling us to make tapered and feathered grinds to level tilted concrete surfaces. With over 30 years of concrete grinding experience, Saber Foundation Repair prides itself on the best looking grinds in the industry, with no stray marks, a smooth consistent non-slip finish, and straight back-line terminations. Each location is completed to American's with Disabilities Act (ADA) standards. Our trucks are equipped with the industry's top of the line dust extraction units to perform a near dustless grinding and are capable of servicing multiple grinding machines simultaneously. Contact us today for your concrete grinding, concrete raising, and foundation leveling needs. We will be happy to schedule an inspection and quote and restore your HOA, commercial, or apartment community's concrete to a safe and level condition.